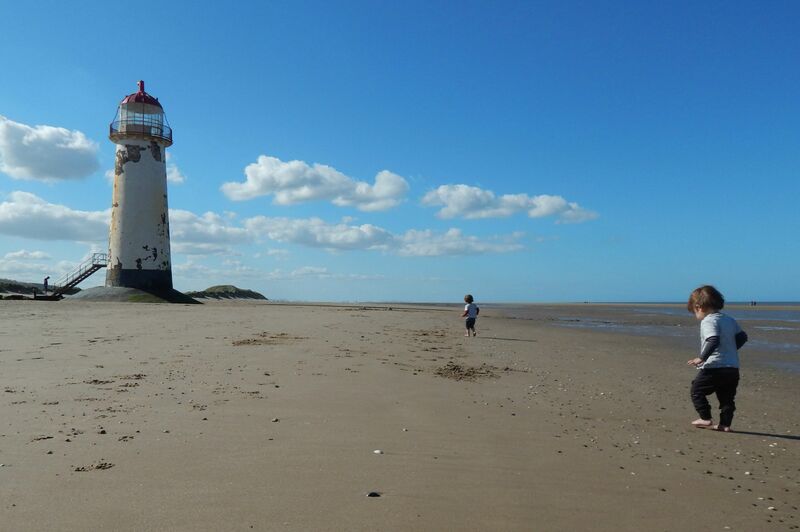 This week’s Living Arrows just had to be a photo from the afternoon we spent on Talacre Beach this weekend. At the grand age of 21 months this was the twins very first visit to a beach and in some ways I’m glad that it came at an age where they could really make the most of it. As soon as we got on the sand Lucas had whipped off his shoes and socks so we did the same to the twins. They were a little unsure when they first felt the cold sand but before we knew it Bear was running off to the first strip of water he could see, can’t those little legs really move when they want to? You start off casually walking behind them thinking they can’t get that far then before you know it you are having to sprint to catch them up. I love this beach in North Wales, it is beautiful in the sun and usually fairly quiet. Having the lighthouse just makes it extra special. Also the silloutte of a man you can see by the lighthouse in the photo is actually my husband with Lucas. They had ran ahead of us to climb the lighthouse steps. We collected a few treasures, I was going for the pretty shells but the twins decided rocks were going to be more interesting. Boo found a giant pebble that he was refusing to let go of and carried all the way back to the car – it is now in our house. Still, this is better than the bunch of bedraggled feathers that Lucas decided to collect! I don’t think I’ll ever get tired of seeing the boys let loose on a beach, they always look so free. They ran everywhere, the wind blowing their hair, looking so so happy. I think they could stay there all day at not get bored, so busy doing nothing at all. Love seeing a beach when it’s virtually empty, and children always look so wild and free when they’re enjoying it. Wow what a stunning spot! I love that the lighthouse is just there on the sand, so totally different to the Devon coast and the boys look like it’s their dream come true!